It's totally wild looking. Hope you like it. Nice. The close up just seals the deal. Dang, A brand new series 2 guitar, you have to envy this guy. Good luck on the guitar, hope to see it further on down the road in its creation. It's extremely straight grained with a very regular alternating pattern of dark and light. I think it's just grand, hope you like it too. The back also has the micro flames. James and Tony and I were admiring the wood tonight. You will be shocked when you see it in person. Yes, it is REALLY stunning in person...I walked by it this morning and had to stop & go back to look at it more closely...what can you say...mother nature's still the number one artist. 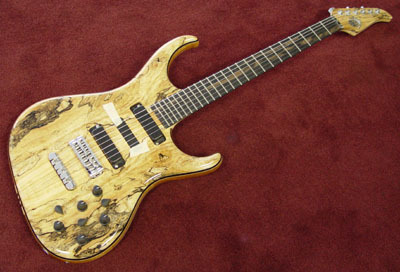 Wow, is that just a regular spalted maple top? It might be the nicest Ive witnessed so far. Wow is as good a description as I can find right now. Needless to say, I'm thrilled! It's stunning - the figuring on the wood is a once in a lifetime opportunity! 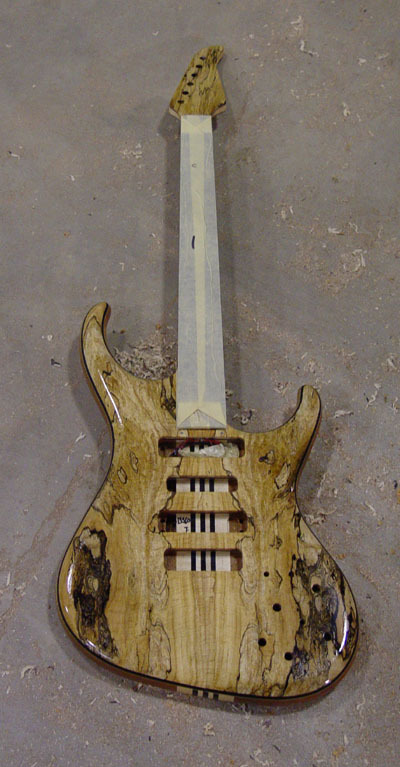 What a fantastic instrument that is going to be once it's finished!!! Shshshshsh- Roger ...I think we have a brand new specie of a "Paul" here!!!! He's a little shy perhaps, so let's be careful! It's also a guitarplayer, mind them thay are always a little weird. So don't frighten them with bassy-talk and sounds. I think it's still a "wild" Paul coming in from the outer world. Maybe we should call him Paul the wild one. Anyway: welcome Paul and enjoy your stay at the club. 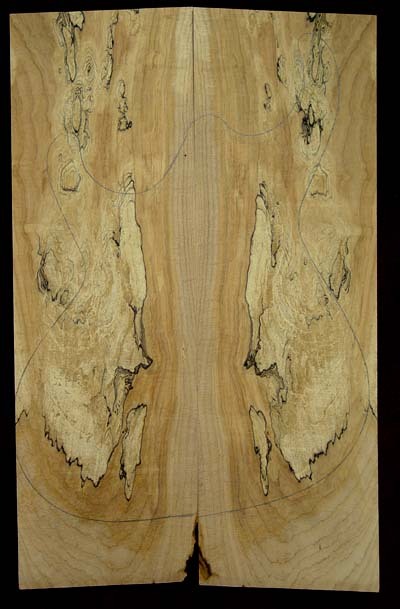 zappahead - it's not a "regular" spalted maple top, it's an incredible one! 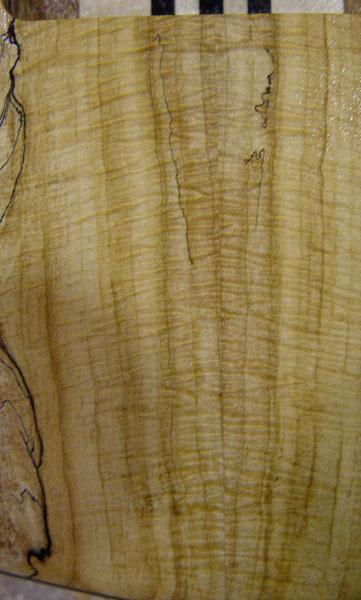 We've had many many nice pieces of spalted maple, but this one is very special. For me, those little micro flames make it. 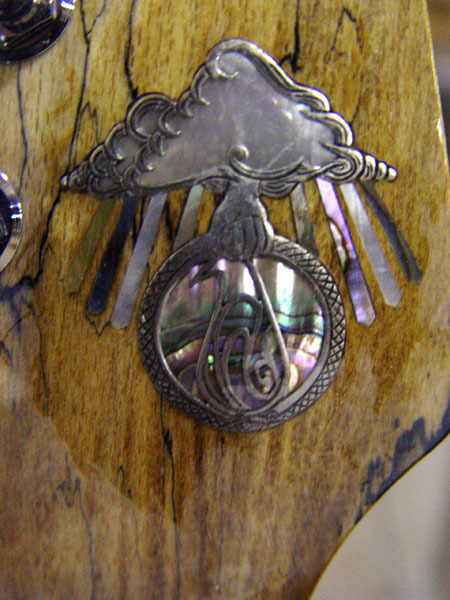 Did you catch the continuous wood truss rod cover? Of course the back is all CWB, but that will be a future picture. I agree on the flames, the curvy wavy figuring with the black lines is the topper. The back almost looks like butterfly wings. 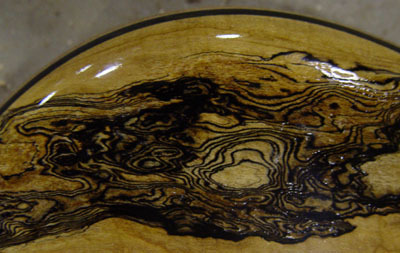 Ive never seen a spalted top with so much figuring and I dont recall seeing flames in a spalted top either. I love the fingerboard too. Add in the series II electronics and this might be the nicest factory to customer Ive seen to date. It should be a "featured custom"! 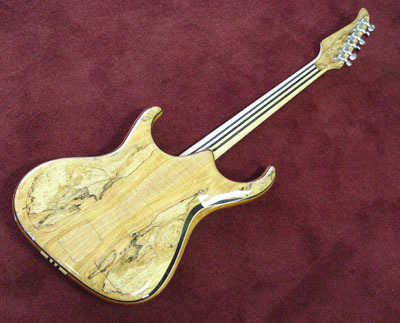 Actually Paul chose a different fingerboard than the one pictured, more along the lines of the one on Yahya's Big Bass to be a little more understated. James did an awesome job, it's one of his best. Some news about this wonder ???? Or too early yet??? Very nice Logo inlay James!!! Paul - we're still building this guitar. The picture was a freshly taken one just before it went back into the spray run. The chrome hardware was just sent to the platers, so it's a little ways away from completion. Thanks and happy holidays to all! Just hopping by to see how work is going at one of my favourites? I don't want to be rude or something but is there some news of this very nice instrument. I 'll accept of course your all wish of discrecy if wanted. So my apologies if I disturbed this making of. It's almost done, I believe the last thing left is for Ron to calibrate the electronics. I guess I missed your request from last month, sorry. It's in line for the calibration. With my dad being out sick for nearly a month, there is quite a line, lots of Series I and II instruments. What a beautiful guitar! 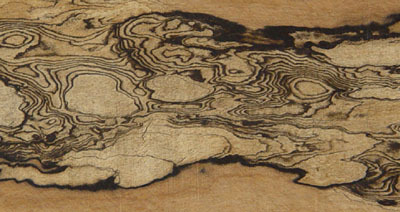 Wow I love spalted wood. 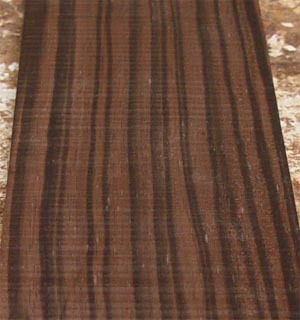 Are the neck laminates ebony? And what is the wood for the body center. On computer screen it looks very dark, could that be ebony as well? I'm sure it will sound amazing. Well I better log off I feel like a dog sitting in front of the butcher shop. The neck laminates are indeed ebony, the body is mahogany, but it does have 2 accent laminates of ebony in the body. Wow! What a great guitar! I can't wait to see a closeup of the fretboard - in the latest shot, you can make out the streaking, and it looks beautiful. 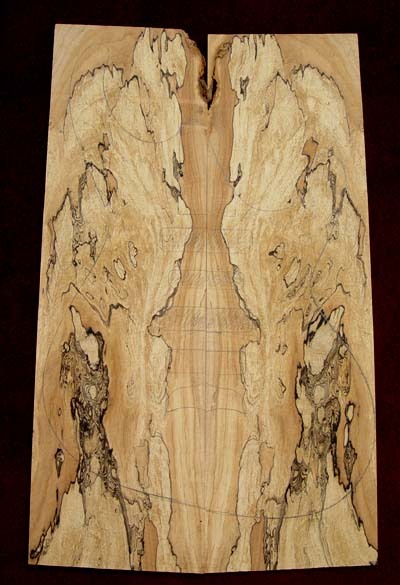 Personally, I'm not a big fan of spalting, but I had the privilege of seeing this in person a couple months ago, and it was just freakin' stunning. None of the pictures here do it justice. That is a beautiful guitar....I know I'm stunned....The logo is perfect....The wood is almost ethereal....WOW! I can hardly wait to see pictures when it's completed.